BC Parks does not manage this site in a manner that guarantees public safety. We would like visitors to be aware that the chance of a dangerous bear encounter here is very high. Serious injury or death from a mauling in a possibility. We require visitors to follow park rules and become familiar with the bear safety information provided: Detailed information about bear safety [PDF 1.53MB]. Doing so may reduce your risk of a bear encounter. Park Rangers are not always on site to monitor visitor and bear behaviour or to protect visitors from dangerous situations. Please strictly adhere to all Park Rules as noted below. When cleaning fish, be sure to dispose of all fish entrails in deep fast flowing water. Secure fish in your vehicle away from the river. Please store all food and packs in your vehicle. To ensure visitor safety please leave the river to a place of safety when a bear is on the river. You may return to angling when the bear is gone. All pets must be on a leash. Keep children and pets close at hand. People not following these rules will be evicted from the park. Thank you for your cooperation. Babine River Corridor Park protects the heart of the Babine River watershed – a wild river, home to steelhead and salmon and to the bears who feed on them. The river originates in Babine Lake, the longest natural lake entirely within British Columbia. The river-based recreational opportunities offered by Babine River Corridor Park complement the upland forest and alpine recreation opportunities in Babine Mountains Provincial Park. Along with protecting significant wildlife habitat, Babine River Corridor Park provides outstanding wilderness river recreation opportunities. World-class angling opportunities for steelhead and sockeye salmon attract local and international visitors alike. Active logging roads surround the park. Exercise extreme caution on the roads and narrow bridges when driving and as a pedestrian. Large numbers of grizzly and black bears frequent the area and use the trails in the park; please take precautions to avoid a bear encounter. Babine River Corridor Park hugs the Babine River for 85 km as it flows from the bridge crossing, 2 km downstream of Nilkitkwa Lake, northwest to Kisgegas, a First Nations Reserve, 10 km from the confluence with the Skeena River. Access to the day-use area by road is approximately 130 km from Smithers. Follow Babine Lake Road east, then Nilkitkwa Forest Service Road north for 58 km. The nearest communities, towns and cities are Fort Babine, Smithers and Telkwa. Approved Babine River Corridor Provincial Park Management Direction Statement [PDF 1.67MB]. Here is a backgrounder [PDF 348.33KB] on this Statement. The Babine River provides internationally significant rafting and kayaking opportunities with 30 km of Class III and IV rapids. The challenges of this white-water should not be underestimated. Guided trips are available through local rafting companies or individuals may plan private trips. Please note that there are no permits required for private rafting or kayaking trips on the river. The only restriction is that only one commercial trip can launch per day. Private groups may wish to avoid launching on these dates. All float trips are requested to pack out what you pack in. Float trips are encouraged to use some form of portable toilet bucket to remove all human wastes from the park. Intensive use of confined campsites creates unsanitary conditions for park visitors. Bear proof containers must be used for the transportation and storage of all food and garbage. Report all aggressive or unusual bear behaviour and close bear-human interactions (i.e. a bear in camp, bluff charge, etc.) to the Babine Area Supervisor, 250-847-7565, immediately following trip completion. All float trips are requested to use a fire pan for fires. The creation of rock fire rings and the burning of wood on shore is strongly discouraged. All surplus or charred firewood/residual ash will either be carried out of the park or deposited in the river. No firewood shall be left on shore. Any viewing of wildlife shall be carried out in a discreet manner and from a distance that will not disturb the animal(s) being viewed. Bear viewing at Grizzly Drop will be limited to 30 minutes above the rapid and 10 minutes below the rapid. Always be on the alert of a potential wrapper rock at the bottom of every drop - it is a good rule for the Babine River in general. Immediately past Gail Creek, you begin the class 4 section that takes you down to the Skeena River with 10 serious class 4 rapids and dozens of 3+ boulder drops. Please do not attempt to do this section of river in the absence of an experienced trip leader. 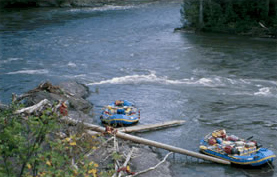 Support boats are recommended when white water boating. Trip leaders should preferably have previous experience on this river. Kayakers should possess the skills to roll their boats in order to challenge this river. World-class angling in a classified river for steelhead and fly-fishing for sockeye salmon is available. Anyone fishing or angling in British Columbia must have an appropriate licence. Give people space. When someone has a fish on, please reel in and give them room to land their fish. When arriving to fish beside someone, give them room to make safe casts. Avoid monopolizing good pools for long periods. Give others a chance to get in and try out a productive pool. Be courteous of others on shore. Be cautious of people behind you when making your back cast. Observe your quota. Please consult fishing regulations and DFO. The daily quota for sockeye salmon are posted by DFO. The experience at the Babine River is valued by many. Understand that your actions can have serious impacts on the abilities of others to enjoy this area. This park has hiking and/or walking trails. For your own safety and the preservation of the park, obey posted signs and keep to designated trails. Shortcutting trails destroys plant life and soil structure. Please be aware that bears use the trails within the park. To avoid a bear encounter, avoid the trails between dusk and dawn and make noise while hiking. Please note: there is a No Shooting Area in the Babine River Corridor Park south entrance please review Map F4 of the BC Hunting and Trapping Regulations Synopsis. There is a paved, single-wide, moderate grade boat launch near the day-use area. Campfires are permitted in the campground. Fires are not permitted in the day-use area. Firewood is no longer provided. To preserve vegetation and ground cover, please do not gather firewood from the area around your campsite or elsewhere in the park. Dead wood is an important habitat element for many plants and animals and it adds organic matter to the soil. You can conserve firewood and air quality by keeping your campfire small. Be prepared to bring a portable stove for cooking. There is a large gravel parking lot for day-use/picnicking. It has a picnic table and a pit toilet with plenty of parking. Campfires are not permitted. Pit toilets are present at the day use area on the river and in the campground 4km to the west of the park. There is a rustic serviced campground 4 km west of the park entrance. There are 10 moderate sized open campsites available. The sites are gravel and have picnic tables and fire rings. Starvation Lake Recreation Site provides overnight camping 13 km to the east of the park entrance. In addition, Fort Babine Lodge offers cabins and camping. It is found 16km before reaching the Babine River Corridor Park on the Nilkitkwa (4000) Forest Service Road. Wilderness camping is allowed for park users travelling down-river. No facilities are provided. This is a user maintained park and everything you pack in must be packed out. Do not bury or burn garbage or human waste. Camping is not permitted in the day-use area.